Table leaves allow you to expand your table’s seating and serving capacity only when you need it. No need to find storage space for bulky table leaves with its self-storing ability. Separate your table, flip open the butterfly leaf and effortlessly put it away when you want the smaller size. Dining tables with built-in storage creates a place to store items you may only need occasionally, allowing you to maximize your dining room storage space. Know where to retrieve special items when you need them such as holiday decor and table linens then tuck them away safely when not in use. 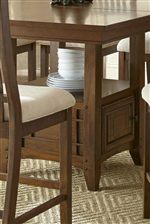 With its counter height and simple storage, this table is perfect for a smaller casual dining space. The table offers enclosed and open storage space in its pedestal, helping you to keep items like plates, bowls, and linens close at hand. A self-storing butterfly leaf allows you to increase the table space easily when you have extra guests. Arts and Crafts detailing and an Oak finish complete the table for a casual look that is warm and inviting. The Kayan Counter Height Table with Storage by Steve Silver at Walker's Furniture in the Spokane, Kennewick, Tri-Cities, Wenatchee, Coeur D’Alene, Yakima, Walla Walla, Umatilla, Moses Lake area. Product availability may vary. Contact us for the most current availability on this product. KY550PB Counter Table Base 1 36"
KY550PT Counter Table Top 1 48" 46"
Leaves One 18" butterfly leaf extends table from 46" to 64". Create a dining space that exudes casual warmth with the Arts and Crafts inspired Kayan collection. 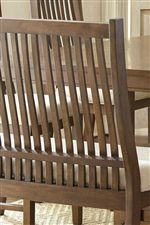 The counter height dining group offers clean lines with slatted chair and bench backs, tapered legs, and stretchers. Storage in the table pedestal makes the counter height table the ideal piece for a smaller dining space, and a bench option ensures ample seating perfect for children. Finished in a rich Oak color and outfitted with poly-cotton upholstery on all seating options, the Kayan collection has a warm and inviting look with helpful space-saving solutions. The Kayan collection is a great option if you are looking for Casual furniture in the Spokane, Kennewick, Tri-Cities, Wenatchee, Coeur D’Alene, Yakima, Walla Walla, Umatilla, Moses Lake area. Browse other items in the Kayan collection from Walker's Furniture in the Spokane, Kennewick, Tri-Cities, Wenatchee, Coeur D’Alene, Yakima, Walla Walla, Umatilla, Moses Lake area.